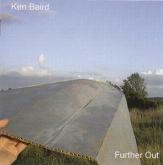 Review: "Baird, Ken: Further Out" - Sea of Tranquility - The Web Destination for Progressive Music! Although Pop-Prog is certainly an oxymoron if I've ever heard one, this particular music scene is constantly growing in high-quality modern musicians. One of these multi-instrumentalists and composers is Canada's Ken Baird. Further Out is his fifth album, and was released six years after his previous full-length, the critically praised Martin Road. So, needless to say, this album was quite an anticipated release by fans of Ken's distinct pop/prog style. If you're a newcomer, but enjoy acts like Radiohead, new-era Marillion, or Kevin Gilbert, this album should be right up your alley. One thing that really amazed me about this album is Ken Baird's immense compositional talents. Although I can't fully appreciate everything about this release, Ken really knows how to craft a great song. Of the 9 songs on Further Out, my favorites are "As Highway Greets a Friend", the IQ-esque "Reflections in the Lake", and especially the epic "Further Out". The rest of the songs are still very strong, but simply don't appeal to my own personal tastes very much. The second half of the album is far superior to the first half in my opinion, mostly due to the masterpiece of a title track. This ten-plus minute song is simply a masterpiece of progressive rock, and shows what Ken Baird is fully capable when he goes all-out. Had the whole album contained a few more songs as strong as this one, I surely would've been more enthusiastic about this release as a whole. The musicianship on Further Out is very solid and professional. I especially have to applaud Ken Baird for mastering so many different instrument and vocal styles. There's nothing too overtly complex here, but the cast of musicians show their chops throughout Further Out. The production is really great. It's clean, powerful, and very professional. Further Out is a high-quality, professional album from a very talented musician. If you're a fan of more commercial-sounding progressive rock, I can't recommend this album enough. If you're not a pop/prog fan, I can even highly recommend it because of the masterpiece of a title track. 3.5 stars are well deserved here for a solid, enjoyable album.